Middletown and Mechanicstown, NY drivers know that a hybrid should prioritize safety and efficiency while still providing a well-fitted interior, which is why they tend to prefer the 2015 Honda Civic Hybrid to the 2015 Toyota Camry Hybrid. The 2015 Honda Civic Hybrid starts at $24,735,* and offers Middletown and Mechanicstown customers a single trim level that covers all the needs and wants to the average driver. 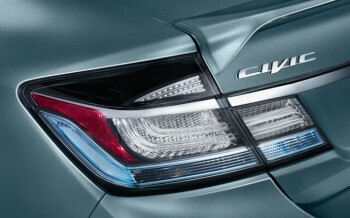 The Civic Hybrid also includes numerous premium features as standard, including automatic climate control, speed-sensitive volume control, LED daytime running lights, a rearview camera, and push-button start. 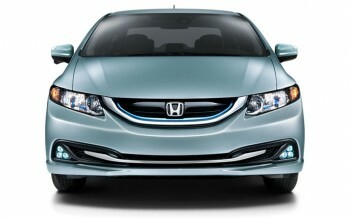 Hybrid with Leather: Starting at $25,935,* comfort will be enhanced with leather-trimmed seats that are heated in the front. Side mirrors are also heated for added visibility and body-colored for a stronger visual statement. The 2015 Toyota Camry Hybrid trims start and end higher, with features spread out over three models. LE: Starting at $26,790, the entry-level Camry Hybrid is not much more than a top-of-the-range Civic Hybrid, but fails to include leather seats or satellite navigation. SE: For a minimum of $27,995, the SE upgrades to sport fabric SofTex seats and a leather-trimmed steering wheel. XLE: Starting at $29,980, the XLE includes an auto-dimming rearview mirror and an upgraded Entune Audio Plus system. The 2015 Honda Civic Hybrid offers a remarkable level of efficiency, which can’t be matched by the 2015 Toyota Camry Hybrid. Pairing a 1.5L i-VTEC with a cutting-edge lithium-ion battery and continuously variable transmission, you’ll be able to achieve up to 44 mpg in the city and 47 mpg on the highway. *With a 2.5L DOHC engine, the 2015 Toyota Camry Hybrid is more powerful. However, that power isn’t sufficient to drastically alter the driving dynamics of the vehicle, and it comes at the cost of efficiency — the central focus of any Hybrid model.Paired with electronically controlled continuously variable transmission, the Camry Hybrid allows Middletown and Mechanicstown drivers to make 43 mpg in the city and 39 mpg on the highway, but those numbers fall to 40 mpg city/38 mpg highway when driving anything but the standard trim. HondaLink Next Generation: Allows you to access news, social media, and even audiobooks, while HondaLink Assist requests emergency services in the unlikely event of a collision. Intelligent Multi-Information Display (i-MID): In addition to displaying a vast array of vehicle information, your i-MID plays music from either Pandora online radio or your USB input. You can even customize the background of your i-MID with a digital photo. SMS Text Message Function: Once you connect a compatible phone to your Civic Hybrid, you’ll be able to receive text messages to the vehicle’s display, then choose to either have them read out, displayed, or stored for later. The Honda satellite-linked navigation system that’s available with the 2015 Honda Civic Hybrid offers exceptional navigational technology. Equipped with a touchscreen that works similarly to a smartphone screen, the system also includes advanced voice-recognition technology that’s capable of discerning street names, numbers, and cities. You can also use Honda HD digital traffic to avoid gridlocks, road work, and accidents.In contrast, most of the 2015 Toyota Camry Hybrid’s available features are provided as standard in the Civic Hybrid, including the two advanced safety features mentioned below. 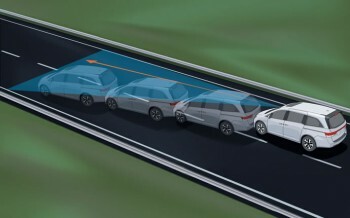 Forward Collision Warning: Monitors the distance between your Civic Hybrid and the vehicle ahead. If it senses an impending risk of collision, you will be alerted through audio and visual warnings. The 2015 Honda Civic Hybrid is available now at Middletown Honda in NY. Contact us today for more information, or make the trip from Mechanicstown to take a test drive.